DMC dive week kicked off first thing Monday morning. I got to the dive locker a bit early to meet with Chris and prep for the week ahead. Chris is the Diving Safety Officer (DSO) at the DMC and will be my main sponsor for the summer. 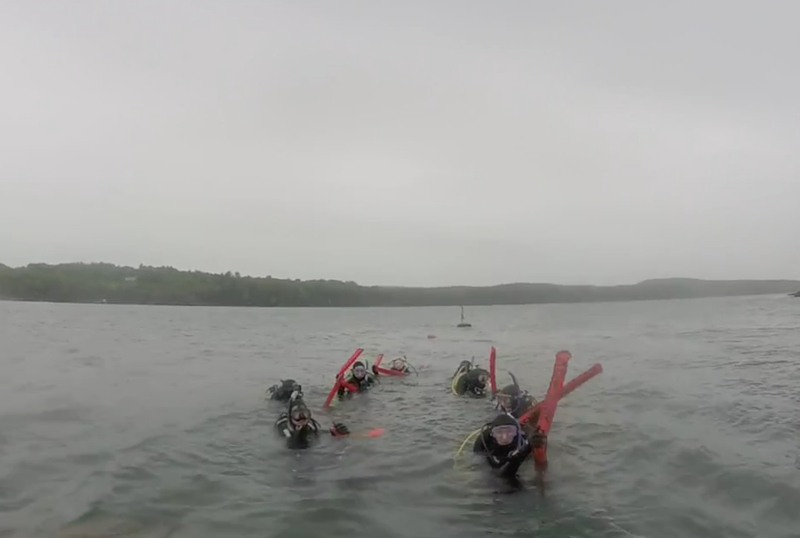 There are six other students taking the scientific diving class this summer, and we all have different levels of diving experience. I’m looking forward to working with a group with such diverse backgrounds in diving because I think we’ll all end up learning a lot from each other beyond what we cover in the course. 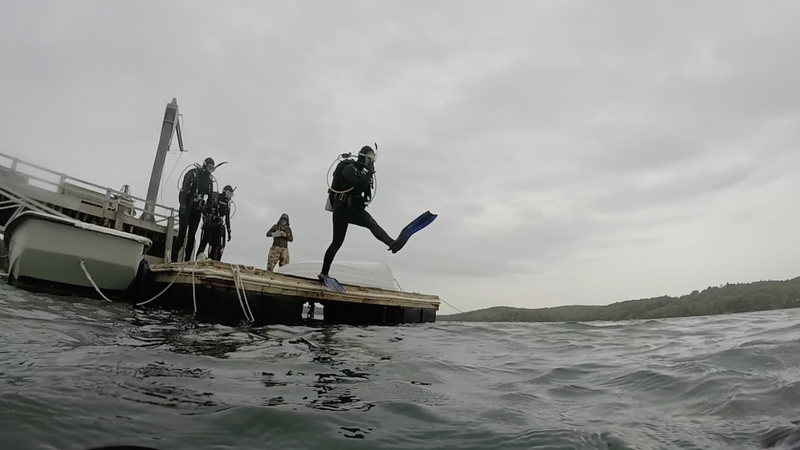 We’ll meet for class every Wednesday until we take the final exam for the Scientific Diver Certification, and each week we’ll focus on a specific set of skills. I’ll also be working with Chris on Tuesdays to work on other diving certifications, prep for class, and help run the dive program. The rest of my time will be spent in Rick Wahle’s lab. 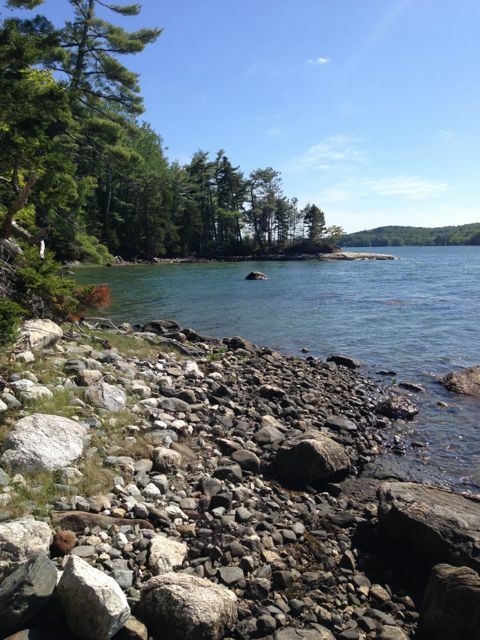 Dr. Wahle offered to co-sponsor my internship for the summer, so I’ll be working with him to develop and implement a project exploring the levels of sea scallop predation in the Damariscotta River. More info to come on that in a later post! Before I can delve into any research, I have to get through dive week. Let me tell you, it was definitely not a cake walk! Everyone was feeling a mixture of excitement and nerves when we first met on Monday. Chris spent the morning going over the expectations for the class and outlining the scientific diving program. We did a gear check before breaking for lunch, and then came back ready to dive in the afternoon. Our first dive was off the DMC dock, and I was paired with Colby, who is a fellow summer intern working in the Wahle lab. She’ll also be working with scallops, so we’ll be doing a lot of diving together this summer. 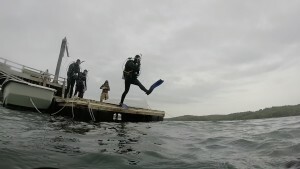 Taking a giant stride off the DMC dock for my first dive! It was a rainy, overcast afternoon, and the water was cold. After letting us all adjust to the conditions, Chris spent the afternoon going over basic surface skills and making sure everyone was comfortable with their equipment. 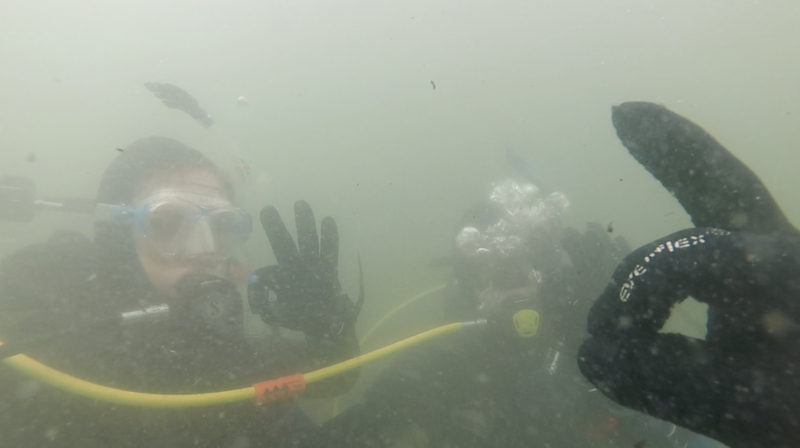 Once everyone was set, Colby and I did a mini-dive around the DMC dock and quickly learned that underwater navigation is much more difficult when you can’t see more than a few feet in front of your face. We managed to find our way around and ran into a spider crab at the end of the dive which was pretty cool! For the rest of the day we reviewed basic in-water skills such as mask removal, regulator retrieval, and alternate air source use. Once all the buddy teams ran through their skill practice we thought we were done for the day, but Chris surprised us with an 800 yard snorkel swim test. The swim test is one of the requirements to be designated as a scientific diver-in-training at the DMC. That designation allows you to participate in research and training dives until you pass the Scientific Diver Exam, as long as you’re supervised by a certified scientific diver. Everyone passed, but we were exhausted afterwards. It was a long day! 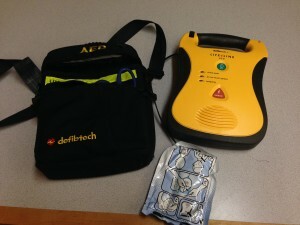 Days 2 and 3 of dive week were spent taking a DAN Diving First Aid for Professional Divers course. The course covered basic CPR and First Aid as well as oxygen administration. This course was different than other first aid classes I’ve taken because it was specifically geared towards divers. It doesn’t sound like it makes a huge difference, but I found it really helpful that the course material was written for divers by divers. Learning how to think and act like a professional diver is something that I want to focus on this summer, and it’s small steps like this that are helping me towards that goal. Once we finished the DAN course, we started preparing for days 4 and 5 of dive week: rescue skills. I was certified as a Rescue Diver through PADI last summer, but I went through the training again with the rest of the class. This course was slightly different because it was through SDI, so it was interesting to see how two different training agencies presented similar material. Taking the Rescue Diver course was one of the more rewarding experiences I’ve had as a diver so far, so I was excited to go through the training again. Learning how to respond to different situations underwater made me much more confident as a diver and helped me to be more aware of my actions underwater. Taking the course again reinforced those skills and made me much more comfortable diving in the environment in Maine. Especially because my previous diving experience is in tropical waters, the cold water temperature, poor visibility, and extra gear necessary for the conditions here is definitely an adjustment. Going through the rescue course again helped me become more at ease and (hopefully) prepared me for the rest of the summer. 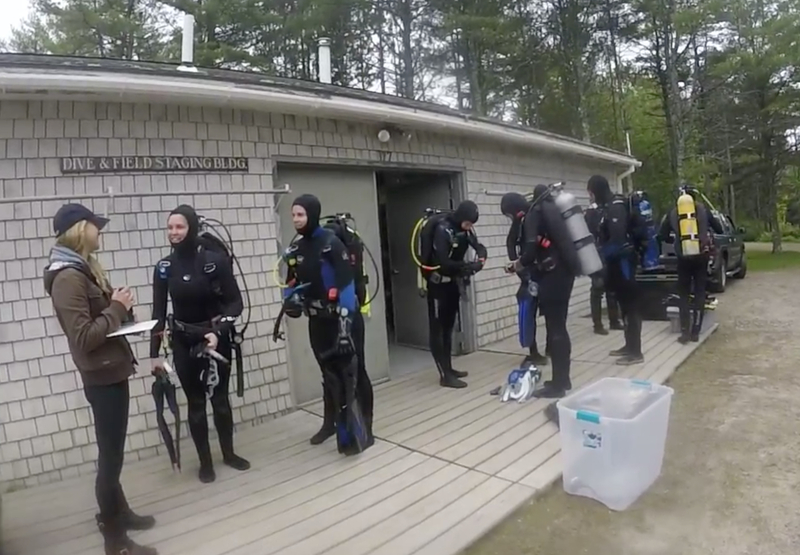 Before taking our final rescue exam, we took a trip to the Boothbay YMCA to finish up our swim tests for the scientific diver-in-training requirements. We all had to swim 400 yards, swim 25 yards underwater holding our breath, and tread water for 15 minutes. Meanwhile, Chris had a final rescue scenario set up back at the DMC. Once we finished our swim tests, we all got suited up and swam out to one of the DMC research vessels and carried out a group rescue situation. As a team, we had to rescue two tired/distressed divers at the surface, get them back to the research vessel, and provide basic treatment. Then, we had to coordinate an underwater search for a third missing buddy, locate the diver, ascend with an unresponsive diver, and get them back to the vessel for treatment. Applying everything we learned throughout the week to this situation while working as a team was challenging to say the least, but by the end everyone felt accomplished and ready to take on the rest of the scientific diving course. Even though I’ve only spent one week at the DMC, I already feel that my diving skills have improved, and I’m excited to see where the rest of the summer takes me. This entry was posted in 2015 American Academy of Underwater Sciences on June 13, 2015 by Catie Mitchell. My name is Catie Mitchell and I’m thrilled to serve as the Dr. Lee H. Somers AAUS Scientific Diving Intern this summer! I’m extremely thankful to the American Academy of Underwater Sciences (AAUS) and the Our World Underwater Scholarship Society (OWUSS) for providing me with funding and support to make this experience possible. In particular, I want to acknowledge the generosity of Dr. Lee H. Somers and his family. This year my internship was renamed in remembrance of Dr. Somers and his immense contributions to the scientific diving community, and I’m honored to continue his legacy. As a rising Junior at Vanderbilt University, I’m pursuing a degree in Ecology, Evolution and Organismal Biology with a minor in Communication of Science and Technology. I’ve always loved spending time on the water and have become passionate about ocean conservation and exploration. This summer, I’m excited to have a chance to spend time underwater and explore the marine world. Before the start of my internship, I spent one month as an Ocean Sciences and Mapping Intern on board the E/V Nautilus in the Gulf of Mexico. I had the opportunity to work with researchers from institutions around the world and was able to take part in three different expeditions. The first expedition was led by the ECOGIG consortium and focused on monitoring the long term effects of the Deepwater Horizon oil spill in 2010 on deep-sea corals. 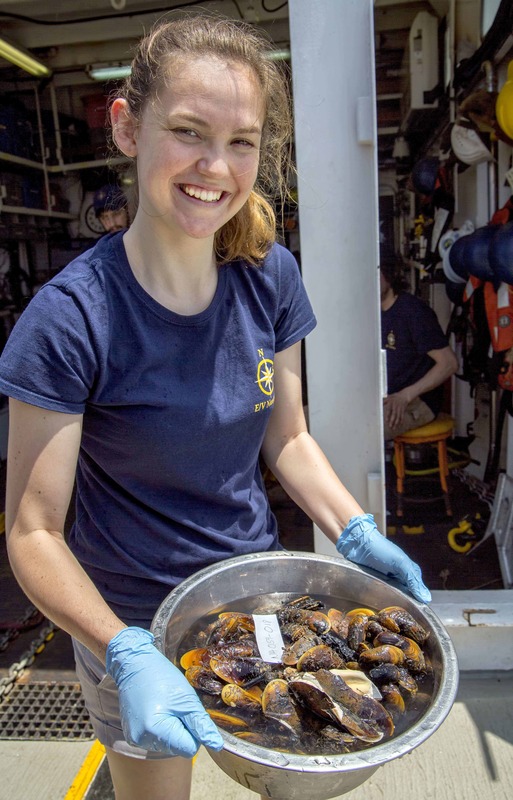 The final two expeditions explored different seafloor habitats in the Gulf of Mexico to learn more about the biological communities that inhabit them. One of my favorite sites that we visited was an underwater brine lake that was absolutely incredible! Overall, my first time at sea was an amazing experience. After about a week at home, I headed to the Darling Marine Center (DMC) in Walpole, Maine to start my internship. I’ll be working towards my AAUS Scientific Diver Certification (along with a few other certifications!) and assisting with different research projects at the DMC. The certification requires a minimum of 100 hours of training and will definitely be the most rigorous dive program I’ve participated in so far. My prior diving experience is purely recreational, so this will be my first opportunity to use diving as a tool and apply my skills to research projects underwater. By the end of the summer I hope to really hone my diving technique. This will also be my first time diving in cold water, which will definitely be a new experience for me. USiA has generously donated a dry suit for me to use, but I’ll be diving wet until I have a chance to go through a dry suit certification course. For now, I’m armed with a 7mm wetsuit, hood, gloves, and booties and hoping that I won’t be a human popsicle by the end of the summer! I spent my first weekend in Maine settling in and exploring the land around the DMC. There are some great hiking trails mapped around the center, and I really enjoyed spending some time outdoors. I have a feeling I will be pretty busy for the rest of the summer, so it was nice to have some down time before jumping into my internship. 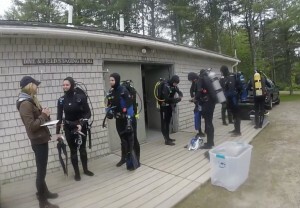 On Monday morning I report to the dive locker for the start of “dive week.” It will be an intense week of training for everyone diving at the DMC this summer to be certified as Scientific Divers-in-Training and kick off the Scientific Diving course. During the week we’ll do several check out dives, learn about dive rescue, take care of the pre-requisites for the Scientific Diver Certification, and complete a DAN Diving First Aid course. It’ll definitely be hectic, but I can’t wait to get in the water and start exploring. This entry was posted in 2015 American Academy of Underwater Sciences on June 7, 2015 by Catie Mitchell.